This page begins to describe our dear old quirky garden. Pear Tree Cottage garden extends to about 3/4 of an acre and is situated on a ridge enjoying a sloping south west aspect. There is a difference of fifteen feet between the highest and lowest points. This means we enjoy amazing views to the west. 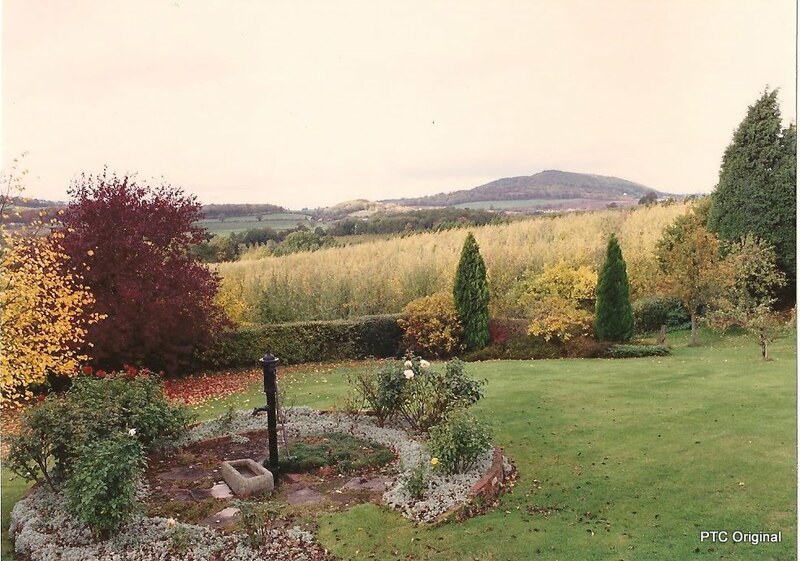 The vistas extend across to Martley Hillside and to the famous local landmark: Abberley Clock Tower. 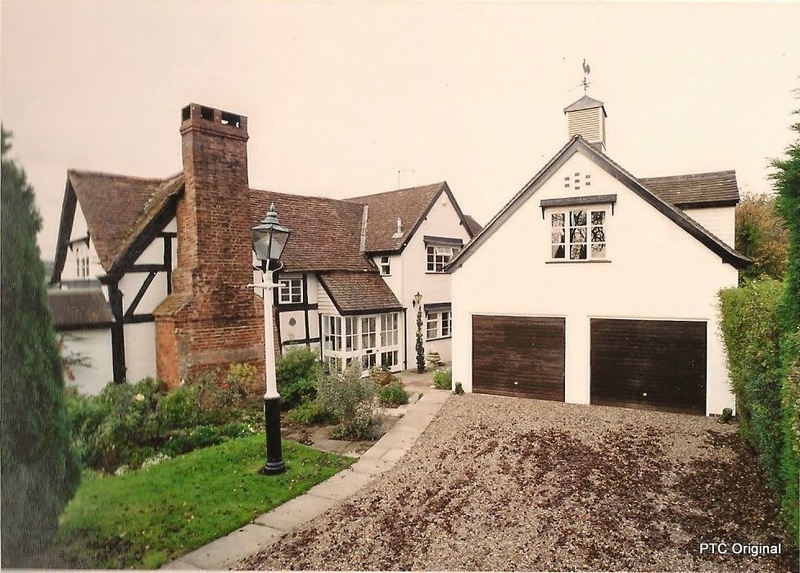 It was obviously much loved by its charming former owners and had enjoyed some landscaping. We inherited some lovely specimen trees and shrubs and also brought many with us! It is surrounded on three sides by one of Bulmers' cider apple orchards. In 2007 the surrounding orchard was replanted with 24000 apple trees. The mostly neutral soil is fairly heavy on a clay base. The surrounding hedges had invaded the garden borders by as much as 3 yards in some places. Many shrubs were very overcrowded and congested - a phenomena of modern planting for the 'instant' look! We even found tree peonies beneath Hebes. There were no composting arrangements and the vegetable patch had really seen better days. It was still love at first sight! On the southern boundary is a high hedge between us and the lane. The border in front of this hedge is our woodland border and my favourite. It contains several mature silver birch trees, some Japanese Maples, a Ginko Biloba, Magnolia and Pieris. Underneath are Snowdrops followed by Helebores, Pulmonarias, Symphitum, Euphorbias, Narcissus, Al's seat and Chris's wooden mushrooms! (See photo on home page.) It's probably at its best in spring. We only spot weed and leave the natural leaf cover rather than fork it over. This border leads uphill to the Fernery which isn't quite as shady as it used to be due to the loss of a big Japanese Maple and a Ceanothus. However it does retain a ferny sort of magic. The stepping stone path between the ferns leads to the top lawn past Cordelia who stands on a rick stone with a chain around her neck to mask an earlier break inflicted with malice aforethought by a then teenage son! From here we arrive on the top lawn which was dug, levelled and re-laid by us in about 2006. We removed a couple of old plum suckers but, in the main border we have planted an Amelanchier, Magnolia, Ekianthus, Catalpa and several Acers & Viburnums. These are all underplanted with differing varieties of Geums. Ridding this border of bindweed has been a REAL struggle and the battle continues. In 2012, we planted what is pretty much a rose garden around the other 3 sides of the top lawn. Nearly all are David Austen shrub roses. Back in the early days, we re-paved the front of the house with reclaimed York flag stones. We also widened the path adjacent to the house enabling it to accommodate wheelbarrow traffic. The path leads from here to the greenhouse, studio and further on to the vegetable patch situated on the highest point in the north west corner of our garden. From here and looking west, we have a little orchard of our own with apples, a cherry and some lovely old pears. This slopes down to Cato's Corner where we have a 'House for Hens,' in the Hen Pen and the Hennery. Looking south from our orchard is a pond and our rock culvert. A grassy path leads to a summerhouse which overlooks the pond and the Sofa border. The Lion Steps take you up to the terrace. From here we have views across Bulmers' orchards to Martley Hillside, Woodbury Hill and Abberley Clock Tower - a well known local landmark. On the north side of the orchard is our Aspen Grove which was planted in 2011. In the highest corner of the garden is Thyme Square and the Vegetable Patch which is a raised bed made from reclaimed railway sleepers. Surrounding the vegetable plot is a greenhouse, the studio and providing shelter on its northern and eastern sides is a native hedge. In the winter of 2011/2012 and in order to have a little more level garden area, we did some terracing to the west of the studio and following down to the house. It meant that we have a now level bed with a pergola and a stoned terrace with a seat. Although this page is meant to give an overview of the entire garden, there never seems enough time for completion . Most of it gets a quick description. One day, I'll get around to finishing this page!